Yes! When you integrate a Scoop.it topic to WordPress (through the SEO / integration menu), and then publish posts there, your curated pieces will be posted to your blog as blogposts, as well as the featured image you chose on Scoop.it and your insight. Better yet, as you use the sharing options to social networks, your tweets, Facebook shares and other social posts will redirect to your Wordpress pages (as opposed to Scoop.it). Note: if the article is not published on your Wordpress please check on the backend of your Wordpress if you can see it, if yes refer to your WP template and choose the good category the organize your content. If you're receiving an error message while trying to perform the above integration, please check the following points. XMLRPC is the service that we use to connect to your Wordpress blog. If you have a recent version of Wordpress, it's activated by default and you don't have to worry about it. 2. What if my XMLRPC service is deactivated? 1 - Login to your WordPress blog as administrator. 3. What if my XMLRPC service is activated but does not pass the test? Please check your credentials and make sure your using a Wordpress user account which has administration rights on Wordpress. 5. "An error occured while connecting to WordPress"
Please check your URL and enter the exact URL of your website (copy/paste from your browser) - we do not take into account the redirection. - Kraken Image Optimizer: prevents image upload. - AIT Pro BPS (Bullet Proof Security): this plugin filters authentication and has been known to reject Scoop.it connexion requests even though a fix can been issued. Solution: the fix should ensure Scoop.it runs fine with this plugin. - Limit Login Attempts: this plugin limits the number of times you can fail an authentication before being blocked and has been known to reject Scoop.it connexion requests occasionally. Solution: you can whitelist the Scoop.it platform outbound IP address through using this plugin (note: this plugin is developed by a third-party and we make no guarantees on it). To obtain the IP address to add to the whitelist, please open a support request. - Sucuri WebSite Firewall: this plugin filters requests to Wordpress sites and has been known to reject Scoop.it connexion requests. Solution: this problem shouldn't occur anymore as the Sucuri team whitelisted the Scoop.it platform. 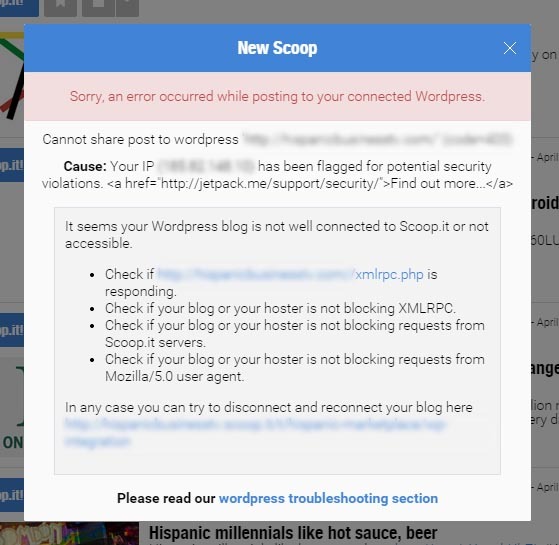 - Bad Behavior: this plugin filters requests to Wordpress sites and has been known to reject Scoop.it connexion requests. Solution: we have corrected this problem on our end and it shouldn't occur anymore. - Wordfence: this security plugin will prevent the connexion with Scoop.it to properly work unless you whitelist the Scoop.it IP address. Solution: to obtain the IP address to add to the whitelist, please open a support request. Once you have it, go to your Wordpress dashboard, scroll down to WordFence, select Other Options within the WordFence menu and then add the Scoop.it IP to the "Whitelisted IP addresses that bypass all rules". If you get this kind of message, it can be caused by Jetpack plugin installed on you wordpress. The plugin blacklisted Scoop.it IP address for some reason. More generally speaking, plugins that secure authentication or that affects publishing can be incompatible with Scoop.it. If you're having problems, please deactivate all your plugins, test if Scoop.it can connect and if it does, reactivate your plugins one by one.